Panadol Extra Soluble Tablets are formulated to provide effective pain relief and help to reduce fever. The tablets contain two active ingredients. Paracetamol is a pain reliever and caffeine acts to further amplify the pain relieving effect of paracetamol. 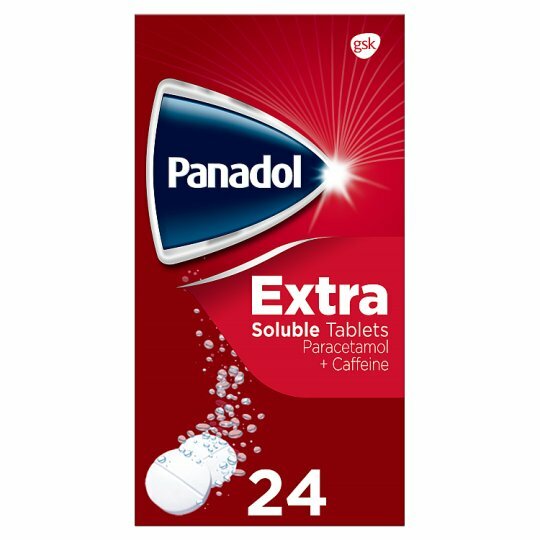 When you've got a headache, Panadol Extra Soluble can deliver powerful, effective relief. And it's gentle on your stomach too. Panadol Extra Soluble can relieve tough head pain including Migraines. Containing paracetamol, Panadol Extra Soluble can also relieve common types of pain, including back pain, toothache, period pain and joint pain. When experiencing pain, adults and children aged 16 years and over should take 2 tablets dissolved in water every 4 hours as required. Do not take more frequently than every 4 hours or more than 8 tablets in 24 hours. Children aged 12-15 years should be given 1 tablet dissolved in water every 4 hours as required. Do not take more frequently than every 4 hours or more than 4 tablets in 24 hours. Always read the label. The tablets must be dissolved in water before taking. Adults: Take 2 tablets dissolved in a tumbler of water every 4 hours as required. Do not take more frequently than every 4 hours. Do not take more than 8 tablets in 24 hours. WARNINGS Do not exceed the stated dose. Immediate medical advice should be sought in the event of an overdose, even if you feel well. DO NOT TAKE Contains paracetamol. Do not take with any other paracetamol-containing products Avoid too much caffeine in drinks like coffee and tea when taking these tablets. CONSULT YOUR DOCTOR Before taking this medicine if you have liver or kidney disease, including alcoholic liver disease, or are on a low sodium diet. If your headaches become persistent, see your doctor. If symptoms persist consult your doctor. Keep out of the reach and sight of children.